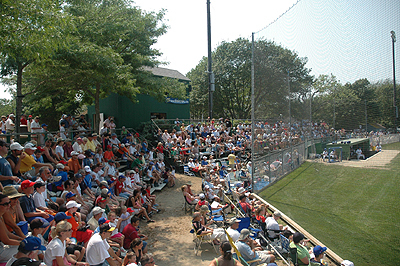 CHATHAM, MA- The sun was shining down on Veterans Field in Chatham, and it shone brightly on the Orleans Cardinals. Bright sun greeted fans for the 1:00 pm showdown. The Cardinals managed to keep their playoff hopes alive this afternoon by mustering a 5-2 win over the A’s. Since the game was a suspended game, it began in the same spot it left off last night which was bottom of the 4th with 2 outs. The only major difference in the line ups were the pitchers. Brant Rustich (UCLA) took the mound for Orleans, while David Huff (Cypress) tried to help Chatham hold on to their 2-1 lead. With the sun shining at 1pm at Veterans Field, there were no worries about fog, only whether or not there would be a second game at 7pm if the Cards could come back. The 7th inning turned out to be the money inning for the Cards who were trailing 2-1 after the game was suspend Wednesday night due to fog. Brett Pill (Cal State Fullerton) led off the inning with a walk, and was then moved to second on a bunt by Robert Perry (Long Beach State) when Chatham pitcher David Huff (Cypress) failed to get Pill at second. After a pass ball that moved both Orleans runners to 2nd and 3rd, Chris Pettit (Loyola Mary mount) roped a double up the right field line scoring both runner and giving Orleans a 3-2 lead over the A’s. The Cardinals then struck for some insurance runs in the 8th and 9th innings. Emmanuel Burris (Kent) led off the inning with a walk and stole second and third on a pick off play that ended up in centerfield. The Cards then capitalized again on a throwing error by shortstop Evan Longoria(Georgia) who threw the ball in the dirt when trying to get Pill out at 1st and Burris subsequently scored. In the top of the 9th Steve Singleton (San Diego) lined a 2 out double down the first base line and then scored on a single by catcher Jason Jacobs (Georgia) making the score 5-2. The Chatham A’s had no luck this afternoon, as they were unable to get their superstar offense going. After the 2 run homerun by Gary Bussiere (U Cal Berkley) Wednesday night in the fog covered 4th inning the A’s were unable to muster anything more than a few walks and singles. Luckily for the A’s they will have another shot at the finals Thursday night as the series moves up route 28 to Eldridge Park in Orleans where the deciding game will be played tonight at 7 pm.